I spotted this Limited Edition Snickers and Hazelnut bar in our post office, which is not a place I normally associate with Foodstuff Finds, but I always have my eyes open just in case. 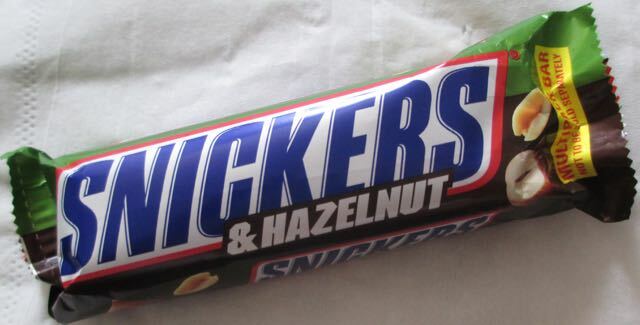 It is nice to see a new Snickers edition that is actually a bit different with a new component, Snickers and Hazelnut. We seem to have had a few new bars where they have had just “more choc” or “more nuts” and not really played about with the ingredients too much. I accept changing the type of nut might not seem revolutionary, but it was enough to gain my interest as I do like my nuts and chocolate. I cut the bar open and took a look inside, I had to admit it did look quite similar to the regular peanut edition snickers. The soft nougat was present and there was plenty of caramel too. I couldn’t tell there was a difference in the nuts based just on appearance. Taste wise the change of nuts was clearly noticeable. The hazelnut has a stronger more wholesome taste, which was a good addition to the bar. There was still a slight hint of saltiness, which gave it that authentic Snickers like flavour. Obviously the carmael and nougat remained unchanged. All in all I like this version of the Snickers bar a lot, I do love peanuts, but hazelnuts are a favourite too. 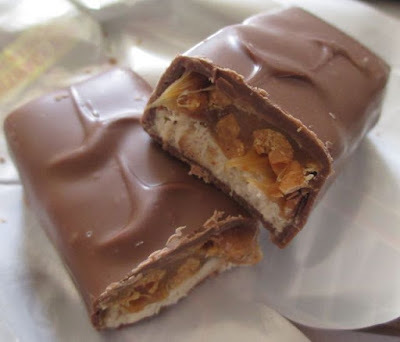 If you combine them with the nougat and caramel you get a slightly posher version of a Snickers, that gets the thumbs up from me. So where do you stand on the Topic then? Talk about being bankrupt of ideas?